We’re Outdoors Again – and a great indoor season we had too. The indoor season shooting at Moulton College is now over, and it seems to have flown so quickly. 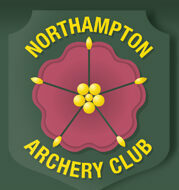 2014-15 was probably one of the most successful winter season’s NAC has ever had, with the John Ashby Sports Hall regularly near to it’s full capacity of archers. All of our competitions have been well attended, and the Robin and Marian end-of-season fun shoot held on 28th March, a Portsmouth round with a twist, resulted in a team of three of our juniors and just one senior (Alan a Dale’s Dudes), beating our most experienced and veteran (if we dare use the term) shooters. Well done – Bailey, Lizzie, Hazel and Heather – don’t eat your Easter Egg trophies too quickly. The outdoor season starts at noon on Saturday 4th April at Sywell Range, Kettering Road. However shooting on Tuesdays will continue at Carlsberg Sports and Social Club until the lighter evenings arrive. The first outdoor Tuesday session will be on 5th May 2015. ← Indoor Open Competition at JAshby.